The volume presents key results of the EU FP7 research project FOCUS. 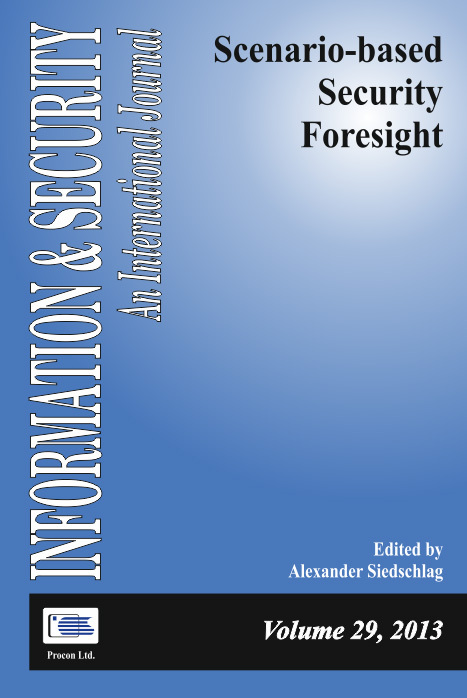 Number 1 provides an overview of the project and presents methods and techniques used in scenario-based foresight and key findings in regard to threats, scenarios, and plausible future roles of the European Union as a security actor. Number 2 links the scenarios to requirements for security research and industry products, along with a provocative view on what Europe needs to do in search of a framework for assessing the impact of global dynamics on its internal dynamics and addressing the future security challenges. Siedschlag, Alexander. "'FOCUS': Foresight Security Scenarios to Plan for Research to Support the 'EU 2035' as a Comprehensive Security Provider." Information & Security: An International Journal 29, no. 1 (2013): 5-17. López, David, and Oscar Pastor. "Comprehensive Approach to Security Risk Management in Critical Infrastructures and Supply Chains." Information & Security: An International Journal 29, no. 1 (2013): 69-76. Procházková, Dana. "The EU Civil Protection Upgrading Needs." Information & Security: An International Journal 29, no. 1 (2013): 88-108. Benesch, Thomas, Johannes Goellner, Andreas Peer, Johann Hoechtl, and Walter Seboeck. "Scenario Space for Alternative Futures of Security Research." Information & Security: An International Journal 29, no. 2 (2013): 111-119. Procházková, Dana. "Natural Disasters’ Management and Detection of Priority Problems for Future Research." Information & Security: An International Journal 29, no. 2 (2013): 127-144 . Monitor, ISIJ. "Acronyms." Information & Security: An International Journal 29, no. 2 (2013): 185-188.